Visitors to Venice rarely wander more than 500 yards from the Piazza San Marco or the Rialto. The result is that some of the most beautiful churches in the city get only a trickle of visitors. A favourite of mine is Madonna del Orto, near the north coast in the far reaches of Canareggio. Anywhere else, this church, full of Tinteretto masterpieces, would be a major tourist attraction. 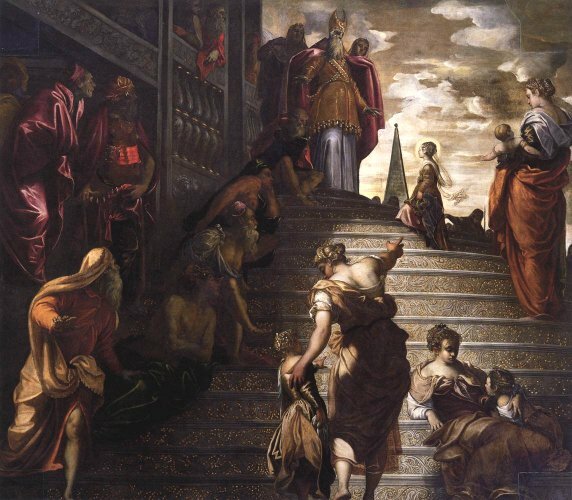 Tintoretto's version of The Presentation of the Virgin at the Temple is high up on the wall. This may make it little difficult to see, but if ever a painting needed to be seen from a low viewpoint it is this one. We will return to the Tinteretto shortly - there is a good deal to say about it. 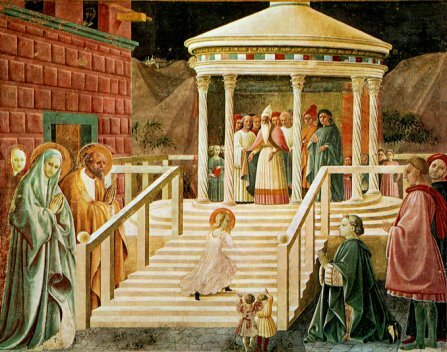 Before doing so let's look at the background to the story of the Virgin's arrival at the temple. These descriptions, with the fifteen steps, were taken on by a range of painters. Not all managed 15 steps - that is quite tricky to manage in a simple painting design - but many did. 15? I make it 14 . . . . So why fifteen steps, and what has that to do with the Gradual psalms? According to a musical friend, it is possible to sing the psalms at a gradually rising pitch, but only if the first psalm starts low enough! This story provided illustration for psalters, and in particular, for breviaries containing the Gradual psalms. 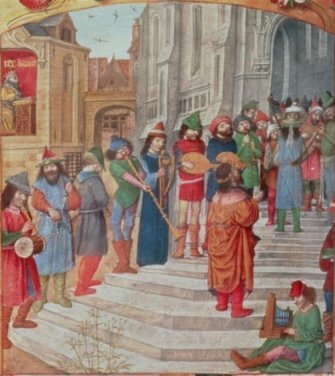 Below is an illustration from the Flemish Isabella Breviary from the late fifteenth century. The figure standing alone represents King David. Now count the steps - yes, 15! Hoc igitur templum in circuitus quindecim gradus habuit. Signa aliqua uidemus: numerate, ex uidebitis ita esse ut dicimus. Leuitae igitur et sacerdotes, unusquisque secundem ordinem stabat in gradibus. The temple had fifteen steps. We see signs, and you will see from this it is as we say. 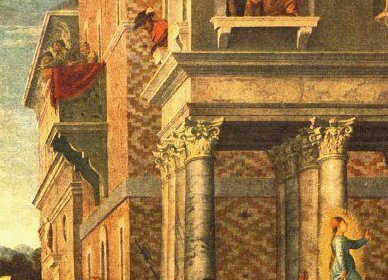 Levites, the priests, every one stood on the steps according to the order. 'Circuitus' has caused problems. Latin dictionaries give 'circular' or 'going round' - this meaning doesn't feature in the Google translation, but it does chime with the Mishnah text below. Any Latin scholars out there who can do better please get in touch! So what were Jerome's sources? The Mishnah (220 CE) is a major collection of Jewish writing, including oral traditions. 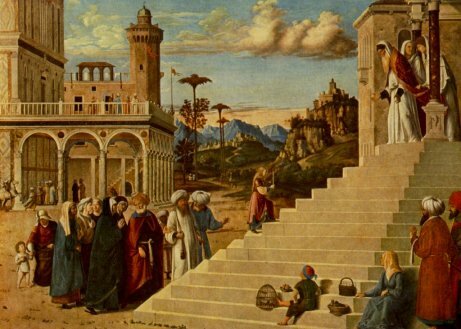 It tells us that the Court of Women led into the Court of the Israelites via a curved staircase of fifteen steps. The general description of the Temple in the Mishnah is confirmed by the Jewish writer Josephus, who knew the remains of the Temple in the first century. Of course, the legend changed over the years. A Christian reading suggested a different set of steps; those leading to the Holy of Holies. Traditionally, only the high priest was allowed to enter, and then only once a year. The immaculacy of the virgin, it was thought, entitled her to enter, though no doubt Jewish theologians would be put out at the idea. 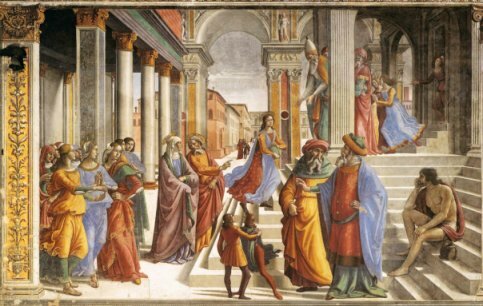 Jerome's Circuitus does hint at the 'curved staircase' though it seems some artists picked up the meaning 'semi-circular', describing the shape of the individual steps. 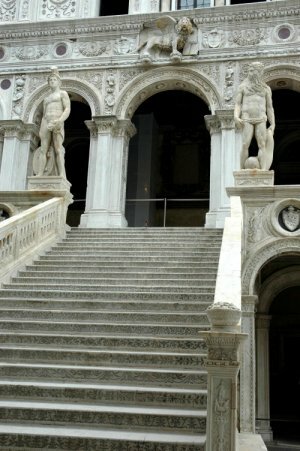 On which note, back to Tintoretto, who hedges his bets by making his staircase both semi-circular and curving. 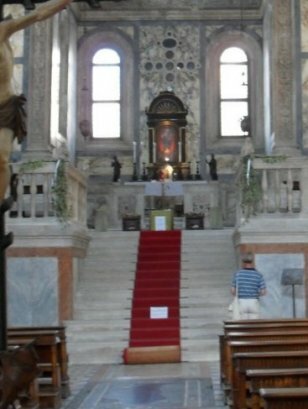 Originally, this picture was in two halves; it formed the doors on the Organ case of the church. Above the organ was the choir gallery - singing, effectively, at the top of the stairs. So Tintoretto was not just paying homage to the Madonna, the dedicatee of the church, but emphasising the scene's musical attributes as well. And that's not all. Look closely at the steps. Where else might you find steps with a pattern like that? Finally, look at Titian's version of the Presentation. Does that pattern on the brickwork remind you of anywhere? It ought to. Venice has never balked at proclaiming its own sacredness. 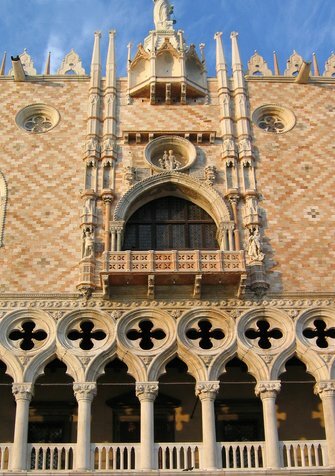 So not just music and the Madonna are celebrated - let's hear it for Venice itself.